L’uovo di Pasqua. The Italian Easter Egg. As you can tell from the photo, these are not those little bite-sized, even two or three bite-sized eggs you’re using to seeing. These are hollow and range in size from palm of your hand to ginormous (think: wrap your arms around it to carry it). 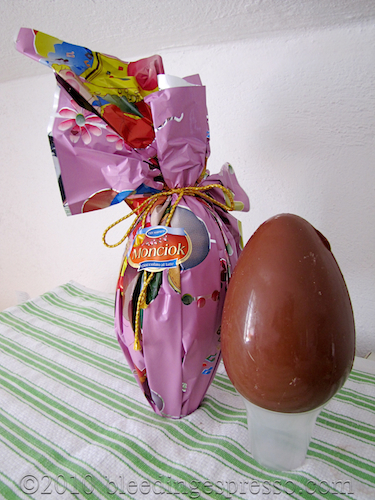 Then since it was open, well, we had to smash it, because the eggs usually have a “sorpresa” (surprise) inside. 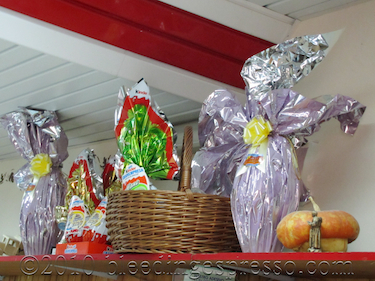 Depending on how much you paid for your uovo di Pasqua, your surprise could be a dinky little toy or something more substantial, but still a toy nonetheless. Stylin’ when it’s done, though, isn’t it? “Collect them all!” says the insert. And in case you’re wondering, there’s no Easter Bunny and definitely no marshmallow stuff or jelly beans. Thank goodness for my mom! I love jelly beans, and now so does P.
Buona Pasqua to those who are celebrating! Buona Pasqua to you, P and the kidlets! .-= Deb R´s last blog ..My husband’s favorite carbonara =-. Looks like the weather is going to be fan-tabulous! Woohoo! .-= nyc/caribbean ragazza´s last blog ..Flashback Friday – Easter Edition – Morning Has Broken – Cat Stevens =-. .-= Gabriele Gualco´s last blog ..Pagina Notizie =-. 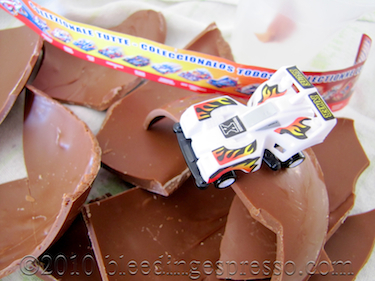 My grandchildren (well one especially) love Kinder eggs, I could go chocolate shopping in Italy all the time. You’re the best kind of grandmother, Anne 😉 The Kinder eggs really are delicious! .-= anne´s last blog ..Blogging and my readers….. =-. .-= Cherrye at My Bella Vita´s last blog ..First of the Month Recipe: Homemade Calabrian Lasagna =-. I swear that’s a Happy Meal toy, but I’ll take the chocolate any day! Happy Meal toys are better quality, I think! But yes, the chocolate is really good, even in the cheapies. I saw that you can get l’uova di pasqua (marca Perugina) in DARK chocolate…was ever so tempted until I saw the hefty price of $17.99. I was too indecisive and wasn’t sure if it was worth it or not, until my friend Roberta said it would be soooo worth it! oh well, will have to wait until next year to indulge (or just order it and enjoy Pasqua a week late!). .-= Melissa Muldoon´s last blog ..• raiperunanotte =-. I do miss these gigundo eggs. 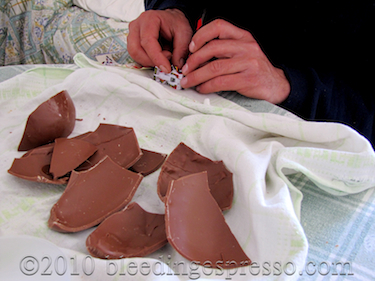 But my favorite Italian part of Easter is…Pasquetta. Also, pastiera. It was a happy accident that I stopped in to buy some pancetta today from a former neighborhood Italian market. (It’s more a trattoria now, but the owner’s parents ran it as a market & were from Napoli, as is his lovely wife.) His wife Giulietta made some pastiera & they gave me some! What a great surprise. A sister will be here tomorrow, so we’ll eat it early. Have a great weekend, Michelle. .-= Susan´s last blog ..Week’s End – Easter Coiffure =-. Was always too cheap to buy the giant eggs that Perugina makes. Also, was afraid I’d eat all the chocolate in one sitting. I saw the remains of one of these eggs that contained a bomb the other day on an Italian news site. What a waste of chocolate! That’s horrible, Gil! And yes, I can’t bring myself to spend more than a couple euros on an egg either…probably b/c I end up eating them so fast anyway. Buona Pasqua. I love those hollow Easter eggs, even with the cheesy surprise inside. But they have to be dark chocolate! Have a great weekend. You’re welcome to all the dark chocolate ones; me no likey…hope you have a great weekend too! .-= Ciaochowlinda´s last blog ..Braided Easter Bread =-. My daughter loves these eggs, here in Croatia we call them kinder jaja (egg) here you can buy them anyday for about 1 dollar, the little ones. But the big ones like your picture I brought one back from San Gimignano and it was *8 euros!! THis will be our first Easter decorating eggs and painting them, should be fun tomorrow. Kinder is one of the brands of them here (the orange and white ones in the first photo) but we have lots of generic, more affordable ones as well…Kinder chocolate is *really* good though, so they just might be worth it. Hope you have a great weekend! .-= Elisa´s last blog ..When your Toddler calls you Mama Lisa =-. Happy Easter Michelle. I remember my son’s first Italian easter egg was nearly as big as him!! This year (and as usual) he requested an ‘Inter’ egg. There certainly are lots of different eggs to choose from, and it is amazing what you can spend on Easter eggs. Yes, especially if you have lots of nieces and nephews! .-= Cathy´s last blog ..Happy Easter =-. Hope you had a great weekend, Joe! Grazie mille! E’ stata una giornata bellissima! .-= Catherine´s last blog ..Citizenship Saturday: The Quest for the Apostille =-. Buona Pasqua, Michelle! These eggs were very popular in Brazil as well (dinky toy and all). I usually would receive a few from my my students. My dad made his traditional Italian Easter bread (with the colored egg in the center for decoration). I’ll try to take a photo and send it to you before we cut into it. An egg that size here costs about 4 to 6 dollars (CAD). The kinder surprise egg I bought for my daughter cost me 10.99 CAD plus tax! I think you got a deal! Her prize was dinosaur. .-= Italian Tapas´s last blog ..formspring.me =-. Love it. This is just like what they do in Brazil too. Yummy tradition! Hope you had a wonderful Easter weekend. Great post. Way to go on the photos. You truly are a photo journalist and excellent communicator. I just wanted to send you the update from Emilia – Romagna. At our local supermarket, the coop, about as big as a 7-11, they had half price Disney eggs, thanks goodness, they were half price, because they were the same size as yours above. We got a 2 magnets, one was for a GIRL and we have boys. .-= Julie ~ jbulie’s blog´s last blog ..? Twitter Facebook Faceoff ~ Top 10 Tips and Tricks from jbulie. =-. Thank goodness for your mom! .-= Wanderlust Scarlett´s last blog ..For The Love Of Chocolate =-. .-= Tarie´s last blog ..Author Interview: Kristy Dempsey =-. I just emailed your article on Deno’s Easter Eggs from 2007 to my cousin, Gingie today. She loved it and knows you. She was your phys ed teacher and had nothing but great things to say about you. Thank you for bringing back memories for both of us. I will read it to my sister tomorrow (Easter). She just has to have her chocolate peanut butter eggs every Easter. Peanut butter are my favorite too; thanks for passing that on to Gingie — please do send my best! Ah! Buona Pasqua! I’ve been secretly reading your blog without you knowing for almost a year now 🙂 and I just had to comment. I adore these giant eggs! At my PAM, there were rows and rows of them, and I just wanted to steal them all they looked so pretty, and were full of my favorite thing on planet earth CHOCOLATE. Gnam. Haha thanks for commenting — and for making my mouth water for Peeps!! !